We are A Phoenix Risen. Like a phoenix, we rise from the ashes. We stand for truth, righteousness, and all that is good. On the sea, we flow with the waves. On land, we soar with the wind. We go where Fate would take us, and never back down. We stand with our heads held high, and our necks proud. We let no one and nothing stand in our way, and fight on until the bitter end. We are A Phoenix Risen, and we will not lose faith. The guild is grouped into 3 Embodiments, Light, Might, and Guidance. Light are the inspirationalists. Those who never back down, they stand tall and proud through adversity, blazing the way for those behind. Might are the force of the empire. Expressing virtuosity on the battlefield, those who raise their sword high, and rush forward without delay. Guidance are the helpfuls and socials. Those who spend their time pondering the questions of others and maintain a happy atmosphere everywhere. We have a triumvirate guild system. The 3 'leaders' are the 3 current Captains of each Embodiment. The 3 Lieutenants are the people that help run the embodiments. If the Captains are not available, the Lieutenants will take over. The Captains and Lieutenants take care of everything pertaining to general guild order. Beneath the Lieutenants, we have Scouts. Scouts are in charge of recruitment. They are people who actively use the AE forums and are in charge of sending recruitment messages. If a Captain is missing, the Lieutenant fills in for him/her. If the Lieutenant is missing, the Scout fills in for him/her. The only time a Scout will take on the role of Captain is if both Captain and Lieutenant are missing. We at A Phoenix Risen agree on this guild system. In recent months, the APR chatroom has become a place primarily used for general chat rather than being centered around DF discussion as a lot of people share many other common interests. Don't let a lack of DF/AE knowledge put you off if you are interested in applying to APR, our prime goal is to provide an environment where people can just relax and enjoy themselves, with many frequent users who do not actually play DragonFable any more. We are currently accepting members. PM Shadows for details. You will be made a member on acceptance to the chatroom, and after a couple of weeks a vote will be held on whether to make you a permament member of APR. IMPORTANT Here is a template form you may use when you are applying. You do not need to use this if you do not wish to. If applying to become an official artist, please use this form. This will be reviewed by Sainsbo. We are lenient when it comes to activity, as we are aware that many people have busy schedules, and real life often has to come first. Long absences are understood and accepted, but it would be much appreciated if you are able to let a Captain know in advance, if you are planning on going absent. If you want a guild signature, private message Sainsbo. For samples of their artwork, look at all the work on their gallery page. The current Clan page banners were made by MegaMage. Please do not use the banners on this page as signatures without permission. For questions on alliances and/or clan councils, private message either Sainsbo, Veranex, or Shadows We are always willing to consider and/or review any requests, applications, or invitations. These are the rules you must follow if you are in APR. They must also be followed in the XatBox. The points beside each rule refer to a system implemented to rule out repeat offenders, though often a lot of leniency is given on first or second minor offenses. 80 Points - Permanent ban, and removal from the clan. Consequences for breaking Major rules: 16 Points - Warning | 30 Points - 1 hour ban | 50 Points - 24 hour ban | 75 Points - Permanent ban, and removal from the clan. Most, if not all of these rules usually are not enforced, as they are not needed to be. There is often leniency unless offenses are repeated. We currently have 30 members. Likes to be called: Sainsbo, Sains. Sainsbo is one of the three founding brothers of A Phoenix Risen. As well as being the Captain of Might, he runs a signature store with Stelios and Zumosmorph called Pulse Graphix, and manages APR’s forums and page, which would include the artwork displayed. Sains is active in forums and chats, and also recruits new members for our clan. His hobbies include playing games such as Call of Duty, Halo, and of course, DragonFable. Shadows is the current Captain of Guidance. Previously, he was sergeant of might and Knight of Justice. Inconstant much? He loves pokemon, and usually can scrounge up a good team when he needs to. He has good taste in games, following up pokemon with Skyrim. Long live Ulfric, the true High King of Skyrim! He's very protective of his friends and family, which is pretty much the clan in general, and is quick to anger if agitated. But hey, if anyone wants to poke that hornet's nest, they can. Verenex has been in APR for a while now, and has had a big impact. Becoming the Secretary, and then the Lieutennant of Guidance, she is now the Captain of Light. She has made many friends, and is an active member of the chat. She has a bubbly personality, and always brightens up your day. Lugia currently holds the spot as Champion of Valor, and earned his title by being a well respected and helpful member of the clan. Silver is pretty much the clan ninja, saying "Welcome back" before I even have a chance to state that I'm back. He's got a great love of making people happy, tennis, and football(sorry NFL fans, the rightly named european version) and will discuss the sports if prompted. He's well liked by many of the phoenixes, and loves to help out any new fledglings. Likes to be called: Odd, Oddie, Weirdsphere, Ball of Oddness. TitanDragonLord is a mountain climber, in both senses of the phrase. He is one of the oldest members of APR, and holds the position of lieutenant. He enjoys playing DragonFable in his spare time, which also includes other hobbies like acting, music, and writing. This chapter details the very beginning of the clan and the trio who started it all. One afternoon. In just one afternoon, the foundations of the guild had formed. BustichiaReki and Doomstalker had been talking. Talking about something new. They were not sure how they could do it. They sat and talked through a 'XatBox'. They brainstormed names. So many names. But they wanted one with a meaning. Something that would speak to the player. And then they had it. A Phoenix Risen. Representing the eternal flame of the firebird Reki wanted the clan to be split into smaller, groups of sorts. And he wanted three. The Embodiments were born. But three? There needed to be a captain for each group. They started thinking of possible candidates for the third leader. And that's when Doomstalker exclaimed: 'Sainsbo!'. A few nervous minutes later, Sainsbo agreed and was inside the XatBox with us. We assigned eachother jobs. Reki was in charge of general maintenance. Sainsbo was put in the position of talent scouting (recruiting). And Doomstalker was appointed as the artist. Recruitment was quick. A list of names was quickly scribbled into a notebook and one by one, typed. Sainsbo then produced a general recruitment form used for any recruitment work. The XatBox was then buzzing with names. The bricks of a solid wall were layed. This chapter revolves around life as a clan and Reki's step-down. It was done. BustichiaReki, Doomstalker (AKA Stelios) and Sainsbo had made a guild. This would be the beginning of an empire. At this time, the guild had to get organized. Everyone was put into the Embodiment of their choice. Then it was time for signatures. Doomstalker had made many a sig over the years, but never had he made so many in such a short amount of time. It was a challenge. A week later, everything was done. Members had the official sigs of the guild. The good times of the clan continued. Our XatBox being the core of communication. That place was our only way of co-operation. And of course there were those times. We talked, we laughed and we joked. We discussed and we puzzled over many things. And thats when it dawned upon us. We weren't a clan. We weren't a guild. We were family. We told eachother everything. Our secrets, our days and our problems And someone always had a solution. During this time, our main leader, BustichiaReki, had to move house. He was gone for almost a week. Members began to worry. But sure enough he came back. But soon enough after he did, he told us that he could not lead the guild anymore. He had hit a busy time in his life. With college, work and personal things he stepped down from his position of Captain and appointed Nightsoul (his lieutenant and 'love') as the new Captain. This chapter describes the revival and the troubles we faced later on. Sainsbo and Doomstalker were lost for words. They had been awaiting good news and it had come. Razen was in the house! He, as our newest member was the glimmer of hope that inspired us to go on. And so... as we began life anew, we realized. Many of the members were inactive. They had joined and then never come back to the Xatbox. We decided to have a cleanup. As the clean-up grows closer, we recruit a new member into the Embodiments of Light. Freedom Fighter. Later in the month of June, a big announcement was made. Our original leader, BustichiaReki was returning. And bringing with him two new Embodiments. Valor and Lightning. APR was a happy clan again. But this was not to last forever. Razen had left. Many of the members had become inactive. The Nest was in trouble. This chapter looks at the mess that APR was in and how the leaders dealt with it. A Phoenix Risen was in a mess. It was decided that the clan needed some new life. But for every person that joined, an inactive had to be kicked. It was a difficult choice, but the leaders knew it had to be done. Suddenly, APR had a new lease of life. The members that were remained continued to be active and the rebuilding of the Nest/Empire commenced. But people still weren't happy. We had a re-vote, and it was decided the 2 new Embodiments, Lighning and valor weren't wanted. We scrapped them, and the members in Lightning and Valor chose a different Embodiment to be in. Now there are 39 places in total. Each Embodiment now consists of 13 members. 3 of them in a leadership position (Captain, Lieutennant, and Sergeant), and the other 10 being members. Members were happy now, and the chat started to fill with friendly people once again. Everything was going great! We had regular meetings, and the clan members started interacting with eachother more, sadly we had to say goodbye to Cursed Hero for a while until he could be more active. TitanDragonlord has taken his place as Lieutennant of Might. Chapter 5: The Maelstorm Arises! This chapter talks about all of the sudden changes made to the clan, and how we managed to solve them. Chapter 6: The Rising of an Empire. This Chapter talks about the changes we made for the clan, and the impact it had on everyone. Reki called for a meeting, and when it was about to start, the chatrooom flooded with people. He announced a few things, and then Reki started talking about my idea. Sub Emodiments. We had a vote, and people thought it was a good idea, thus 3 new Embodiments were born. Captains now managed 2 Embodiments each. We brought Valor back to associate with Might, Lightning sounded too much like Light, so we had a vote, and it was settled we would call Lights sub-Embodiment Justice. Now we just needed a sub-Embodiment for Guidance. We asked members for ideas, and Death shouted out "Wisdom". It was done. Everyone liked the names. Death also said about a member capactiy for subs, and it was settled at 6. No Captains, no Lieutennants, no Sergeants, just a Watchman/woman. Other smaller changes were made at the meeting. Inspirational poems and speeches were said, and Lieutennants were made owners of the Xatbox. Everyone was happy. Settled into the new sub-embodiments, A Phoenix Risen has been running smoothly, with the choice of Zumosmorph as Sage of Wisdom, Chaoto as Champion of Valor, and Kito Domi the Knight of Justice. Along with the coming of the sub-embodiments, we established an alliance with BoH, allowing each to freely roam among either chat rooms. A schedual of regular meetings was established, with many people turning up to them, even faces whom which we have not seen in quite some time. However, there has been strife within our own walls over the philosophy of the Phoenix. 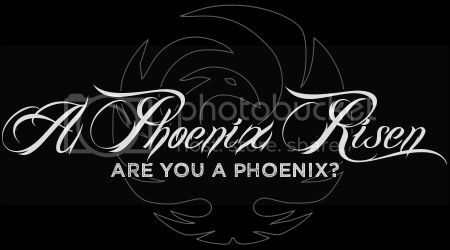 Reki feels that we have not stood by the principles on which we were founded, and that we should take time to reflect and ponder what being a Phoenix really is. No one has left since the last chapter, however, a couple of members have been kicked for breaking multiple clan rules. At this period of time, a whole host of interesting personalities appeared in the chat room. New faces such as Veranex, MegaMage and Kisangre lightened up the chat room with their energetic and humorous attitudes. Sometime during this period, Kito Domi ad Zumosmorph were promoted to Captain rank of the Embodiments of Light and Guidance respectively. Stelios, one of the founding members of the clan stepped down and took a hiatus due to real life problems. Cursed Hero, another member who had been at APR since the early days also took some time to catch up on things. However despite these setbacks, APR continued to flourish and grow into a stronger clan than ever before. our memory. APR is currently holding an election for new Captain of Light. After long-time captain Kito Domi stepped down, APR needed a new leader for the Embodiment of Light. After voting, Veranex came out on top with TitanDragonlord coming a (very) close second. Soon after this was a very special occasion - On May 8th, APR became one year old. Speeches were given, hugs were exchanged through Xat and Stel had cake at midnight. Of course a year was a momentous occasion, as it would be for any clan, but at the end of this, a change had to be made. Sometime in late May, Zumosmorph, 2nd Captain of Guidance stepped down from his position as Captain due to having hit a busy time in real-life. Almost immediately however, polling began for a new Captain. This poll was won by Shadows Morgenstern, with TitanDragonlord again coming a very close second (Only one vote between them). However, more changes were yet to take place, with Captain of Might Sainsbo suggesting two new ideas that will affect clan life considerably, who knows what will happen next?